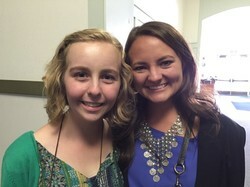 Molly Bates is a senior pre-medical major at Eastern Kentucky University. Elle Lefebvre is a senior at Pacific Ridge School in Carlsbad, CA. She has a younger brother with CF and has done a student medical internship in a hospital in the Philippines. ​Molly and Elle researched the possibility of a laboratory method to accurately predict clinical patient response to VX-770, a new CF treatment being developed by a pharmaceutical company called Vertex. They performed experiments and analysis to measure chloride currents across epithelial cell membranes from several patients, some of whom expressed rare CF mutations. That lab data was compared to actual clinical response data from the same patients to determine a correlation between a given patient’s in vivo and in vitro response to VX-770. This research is aimed at identifying a test that can determine which patients with rare CFTR mutations (in whom VX-770 is not being tested) would likely benefit from VX-770. This type of personalized medicine may be the future standard of care for CF and many other illnesses.